This photo is of a place where there is no machine to hull the rice. Gbli Bessi, a hamlet, is located about 20 Km from Depa (where Project Hope and Fairness built a rice hulling operation). 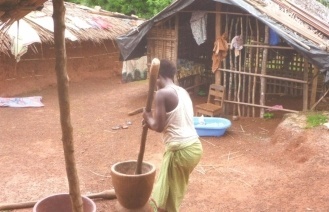 The woman who is pounding the rice is Lekadou Gbagbo. She has to hull the rice the old-fashioned way because she can’t afford to haul the rice to Depa. She told me that if there were a cargo trike (like the one that PH&F donated to Zereguhe), she could have saved herself a lot of trouble. Right now, it’s rice hulling season, but the facility in Depa has only processed 120 Kg because we are in a severe drought. As always, we thank Project Hope and Fairness for all they have done for us.